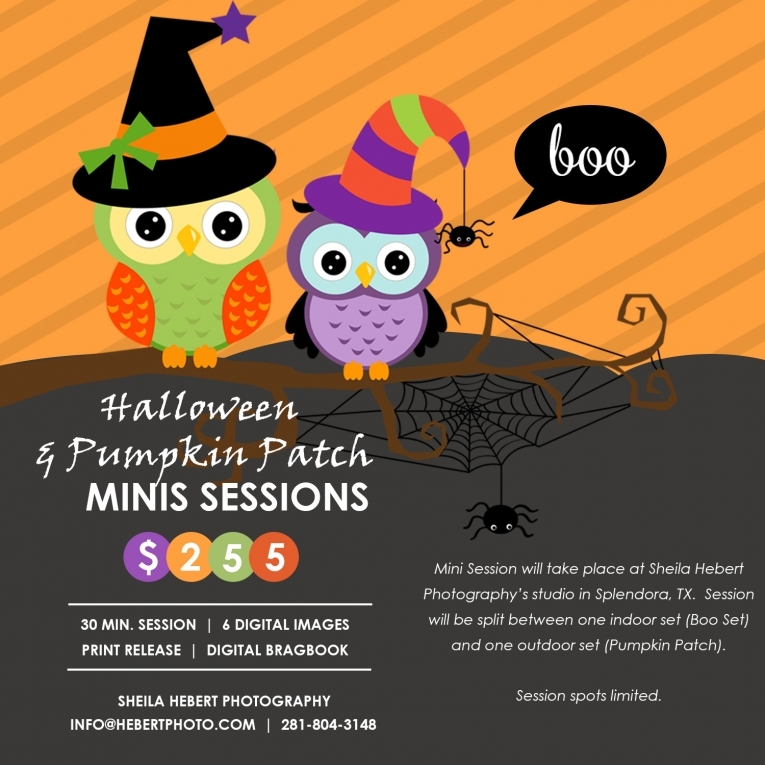 On October 16 & 17, 2015, Sheila Hebert Photography will be offering Halloween & Pumpkin Patch mini-sessions (back by popular demand)! Two sets will be available for this SPOOKTACULAR event: first the “boo set” inside and then the “pumpkin patch” will be outside just behind the studio. The session will last about 30 minutes and include both sets. Your session includes a 30-minute session, 6 digital files, and a digital bragbook to share with family & friends. The special cost of this mini-session is ONLY $255 (plus tax) – that’s way less than half off regular prices. I’m offering a very limited number of these mini-sessions so please don’t wait. Please call the studio (281-804-3148) or email (info@hebertphoto.com) to schedule your appointment. At this price the spots won’t last long. Please note that your session fee/cost must be paid at the time of scheduling your appointment. This price is good for only one subject per session. Please add $25 for each additional subject (your collection will be split between subjects). Welcome to my newly designed website! However, please be aware that it’s still “under construction” and a lot is missing at the moment. I hope it will be all completed very soon. In the meantime, please feel free to visit my facebook page to see the latest sneak peeks (www.facebook.com/sheilahebertphotography). You can also email or call for more information (281-804-3148 or info@hebertphoto.com). It’s time to start thinking about Fall Family Sessions!!! One of the most asked questions I get is “What Do We Wear?”. Well, I’m definitely no fashion expert myself. My favorite outfit is a t-shirt, shorts, and flip flops:) But I can give you ideas on what looks best for family portraits…hey, it’s what I do! Wear colors that compliment the season. Browns, blues, grays, yellows, and oranges are good colors to think about. You can always add a pop of color as an accessory (a scarf, chunky necklace, etc.). Coordinate everyone’s outfit. This doesn’t mean that everyone has to be in the exact same color. Just make sure your colors all look great together. Think about where you want to display your family images. So you want a nice size canvas on your mantle or wall showcasing what’s most precious to you – YOUR FAMILY. Make sure your clothes you’ve picked out for your family session compliment the colors in the area of your home where you’ll display your family pictures. Again, doesn’t have to match exactly – just be sure that your family photos don’t clash with the rest of your décor. Stick with solid colors. Solid colors look the best in photographs. Distracting prints on clothing will take away from the real subject. If you must have prints in clothing, think about this…kids can get away with wearing prints more than adults. Kids wearing prints is also a good way to break up solid colors worn by the adults and add a pop of color to the image. Textures are good! Sweaters, jackets, scarves, and even belts are a great way to add texture to an image. Accessories are good! 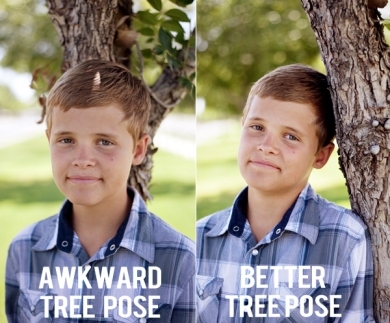 Don’t forget this step when planning for you fall family photos. It’s the little things that make the photo. Don’t advertise for a clothing company. Well, unless you’re a Gap model – then it’s okay if you wear a shirt displaying their logo. But for everyone else…clothes with logos and text are very distracting and take away from the subject of the photo. Add layers. Layers can accessorize your outfit and add texture. It’s also a great way to mix and match between neutrals and colors that can make a photo pop. Layers also allow for quick outfit changes without actually changing clothes completely. Don’t forget your shoes! Yes, it’s happened more than once. A family shows up with the cutest outfits, but dad has left his shoes picked out for the session at home (shame on him lol)!!! The tennis shoes or flip flops he’s wearing just don’t do the outfits justice. Or someone spends so much time coordinating the clothes that they completely forget about the shoes or boots or whatever footwear looks best and they just grab tennis shoes for little Johnny right before they leave the house (grungy tennis shoes…no no no). So when planning you’re outfits, don’t forget to plan what your going to put on your feet. Not all of your family images may show your shoes, but some do and there’s nothing worse than when the shoes ruin the perfect family photo. Have fun & don’t stress!!! This is probably the most important one of all. Even if you clothes aren’t perfect or dad left his shoes at home…just shake it off and go with the flow. My job as a photographer is to make you look your best. If everyone’s scared of you (lol – mommys gonna snap) and you’re completely stressed out…IT WILL SHOW! Take it easy and trust your photographer. Follow Sheila’s board 2015 – What to Wear for Families on Pinterest. Also, my favorite place to shop!!! Fall clothes are out and great sales going on at Target! Click here to go shopping at Target! You know the drill, you’re at your child’s play, about to snap a picture of your kid and just as you push the shutter button a crazy teenage boy jumps into the background of your photo and totally bombs it! Watch for photo bombers in big crowds. Trees are a great addition to any photo, depending where they are placed in the composition. If you want your subject to stand by the tree, place them next to the tree, not directly in front of it. Having a big trunk coming out of their head can look terribly awkward! That goes for anything in the background that can appear to growing out of someone’s head. You need to update your profile picture and happen to be in the bathroom fixing your hair. You snap your own “selfie” and love the photo! Later looking back you realize that the bathroom hand dryer and feminine napkin dispenser also made it into your image. Uh-oh! Trash that one! Especially if your a guy!!! Unless you really love the look of double chins, hold your camera above your eye level when shooting yourself, or above your subject’s eye level. This helps to thin out the face of the subject whereas shooting from below the chin puts more emphasis on the extra baggage commonly referred to as a “double chin”. Contrary to popular belief, shooting in the direct sunlight isn’t the ideal place for lighting. It causes your subjects to squint and also creates harsh shadows under their eyes, nose and chin. Instead, look for a shady spot that is still evenly and well lit. Your subject will have a nice evenly lit face and much less squinting. Way more appealing and professional-looking picture! Especially if you are shooting in low light situations, it’s important to hold the camera very still when shooting. Any movement from your hands can cause your photo to turn out blurry. When you shoot in a low light situation and your not using a flash, your shutter speed will slow way down in order to get enough light on the subject. That slow shutter speed can be the reason for blurry photos. Always choose the most well lit area possible for the best quality picture!